Both barcode libraries - DMPS_E and DMPS_D - are required to start protecting your products/documents. 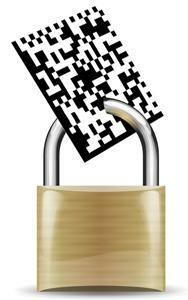 Data Matrix Security software comes with trial Authentication Key (User ID). "Operational" Authentication Key for your company will be mailed to you within 24 hours after the purchase. Optional for OEM customers: 2DTG can supply User ID Generator, so you can create different authentication keys for different customers or groups of customers, as you wish. Enable authentication mechanizm while encoding datamatrix label using DMPS_E and Authentication Key before planting it on your products/documents. Encrypt datamatrix label while encoding it using DMPS_E and Encryption Key (Product_ID) before planting it on your products/documents for additional protection, if necessary. Provide participants of this network (or have them purchased) DMPS_D datamatrix decoding software. Your brand/product/document is protected now!